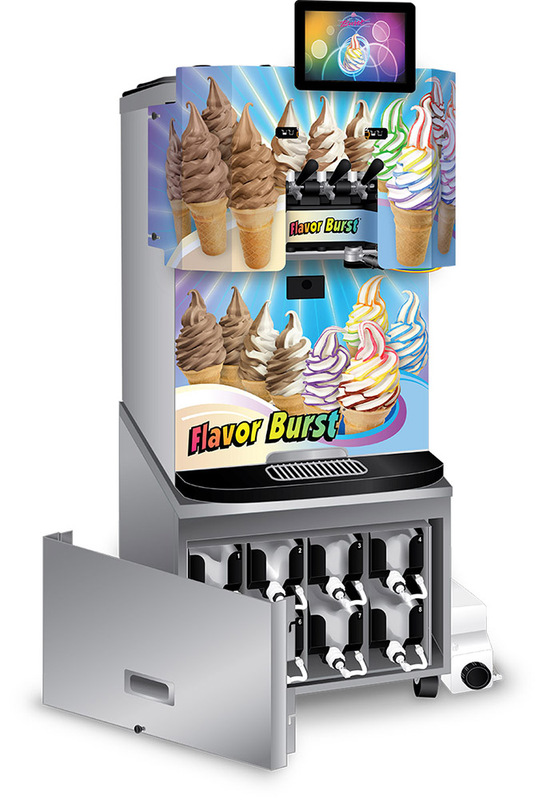 The Flavor Burst soft-serve system is a revolutionary add-on to your current soft-serve freezer. 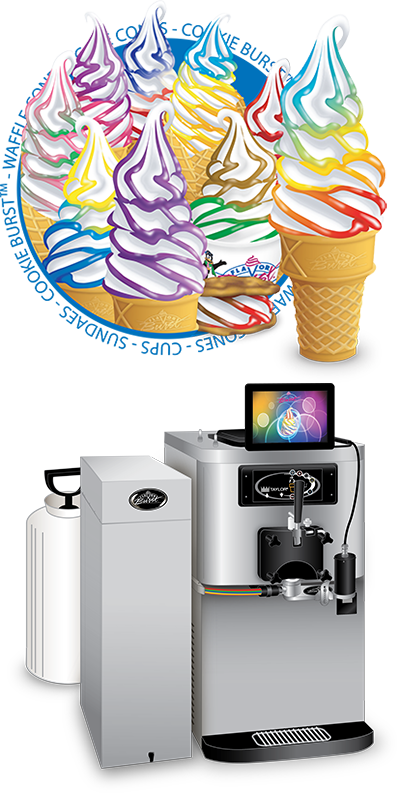 It allows you to stripe your soft-serve product with a variety of flavors from one spout. 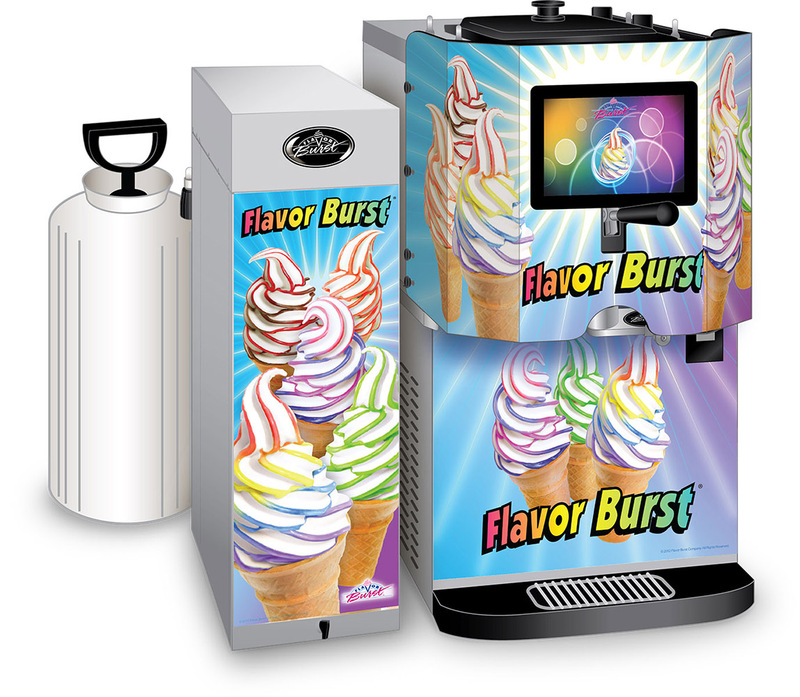 Flavor is applied to the outside, as well as a stripe inside the middle of the product for flavor throughout! 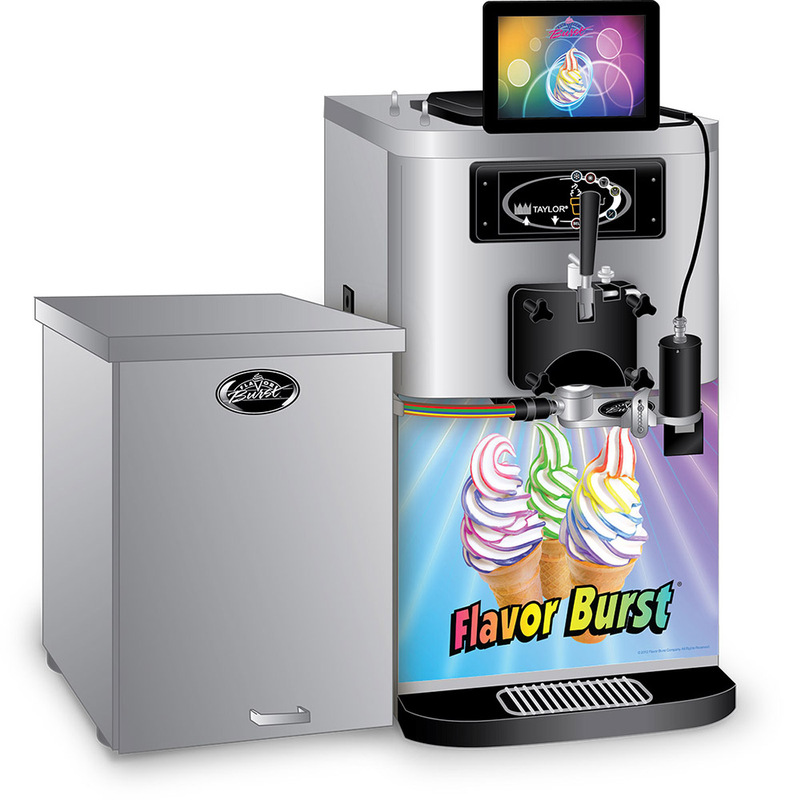 Simply select your flavor(s) from the screen and draw your serving; the Flavor Burst systems mixes in the flavors at the spout. 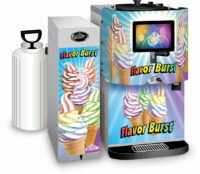 The result is a fun, colorful treat filled with great-tasting premium flavors! 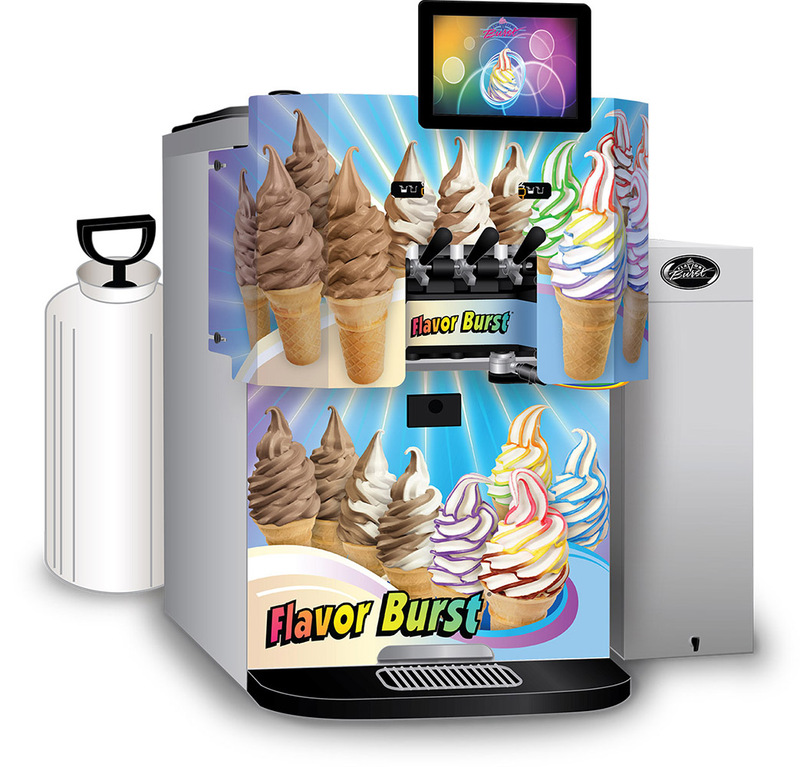 Choose from 37 different soft-serve flavorings, from classics like Chocolate and Strawberry, to more unique flavors like Pistachio, Birthday Cake and Butter Pecan. Flavor a variety of base products, such as ice-cream, yogurt, chocolate ice-cream, and even some custards. 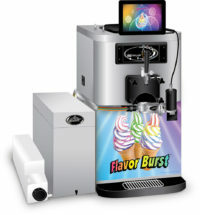 For more information on the Soft Serve Color Touch Panel systems, download the SPEC SHEET. The standard CTP 80SS houses 8 flavors in a tall cabinet, 2 trays wide by 4 trays tall. It is designed to sit beside the freezer, whether on the floor or on the counter. 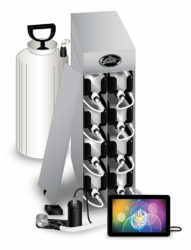 The sanitizer tank is external and holds 3 gallons of sanitizer solution. 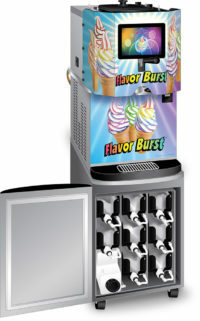 Flavor Burst also offers mobile carts and freezer shelves for this model. 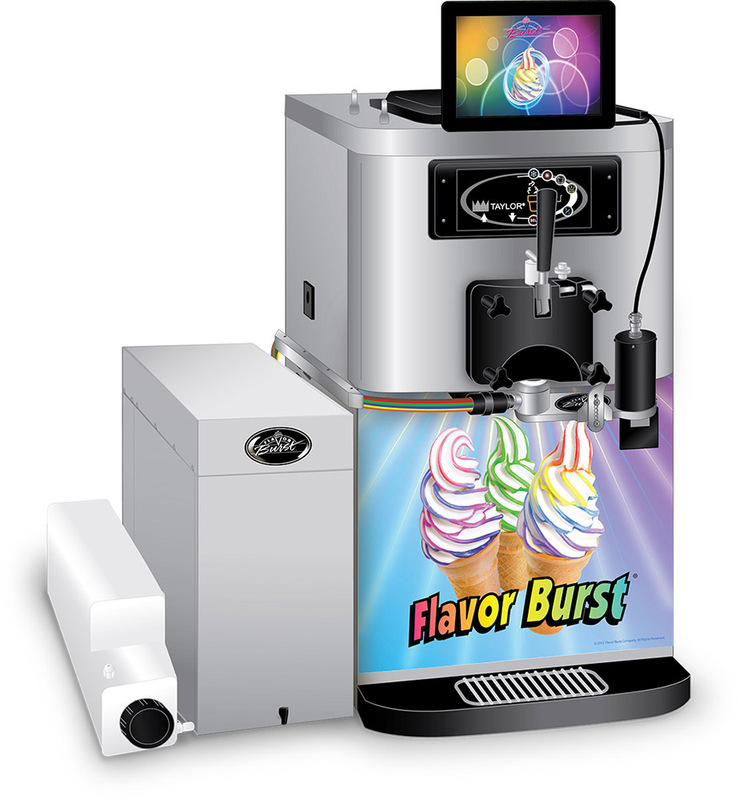 The CTP 80SS-DLX “Deluxe” model is an eight-flavor system with a redesigned cabinet, remote electronics box, and an internal sanitizer tank. It is shorter and wider than the standard cabinet, 3 trays wide and 3 trays tall. 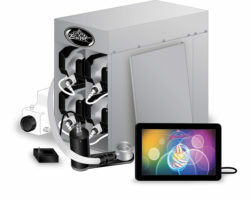 One of those spaces houses a smaller 2-gallon sanitizer tank. The shorter height makes this model able to fit under most counters. This model also comes with an integrated door that lifts up and slides into the cabinet itself. 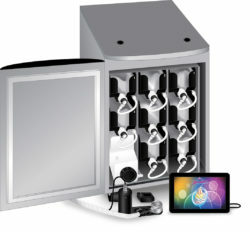 The electronics box (seen on top of the unit) can be installed in various locations. The CTP 80SS-INT “Integrated” model has the same 3×3 layout and internal 2-gallon tank as the Deluxe model. 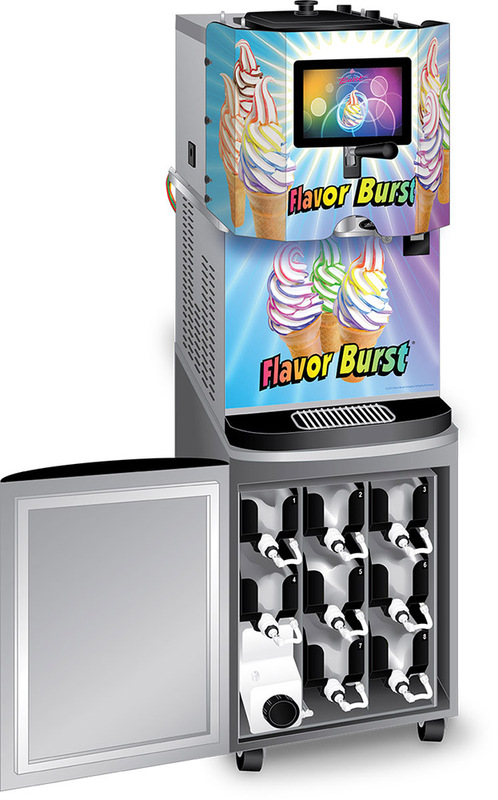 But this model integrates the 8-Flavor concept into the Taylor C201 cart, which is designed as a base for the Taylor C706/707/708/709 freezer models. 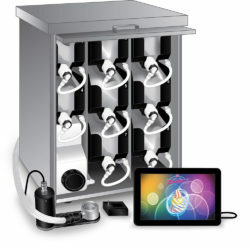 Even the electronics are contained within this cabinet. 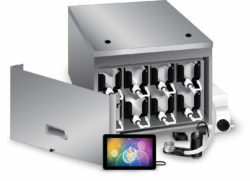 With the C201 cart and CTP 80SS-INT system, everything is stored under the freezer, saving space with a small footprint while having a clean and simple look. 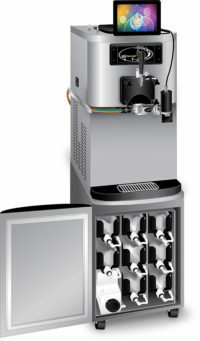 The CTP 80SS-INT model requires the C201 cart and is not a stand-alone model. 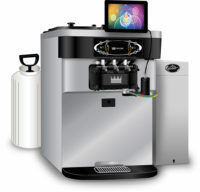 The Taylor C201 cart is sold separately. 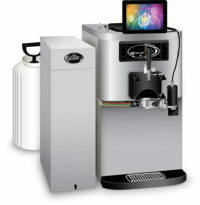 The CTP 80SS-INT-2S “Integrated” model also fits within a Taylor cart. This model is designed for the C206-WFB and C206-WKN carts which support the Taylor C722/723 twin twist freezers. 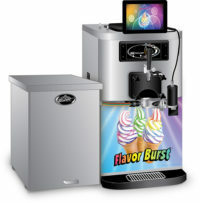 The 8-flavor system is configured into a compact 4-tray wide by 2-tray tall arrangement, with an external 2-gallon tank. Like the regular “INT” model, the electronics are internal for that clean look. 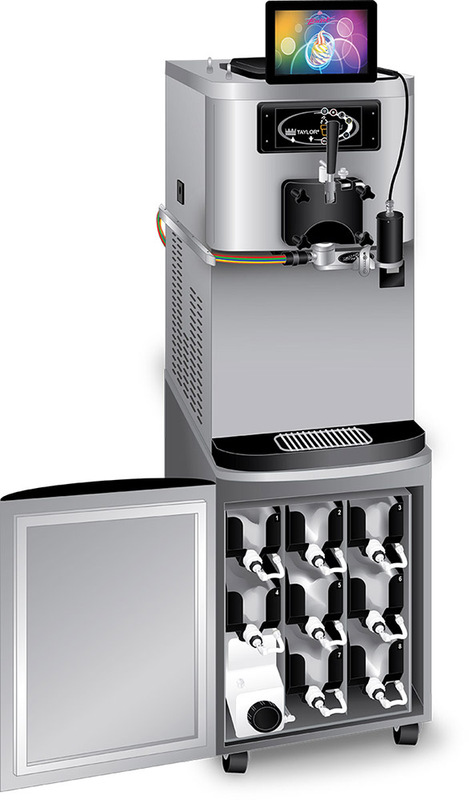 The CTP 80SS-INT-2S model requires a C206 cart and is not a stand-alone model. 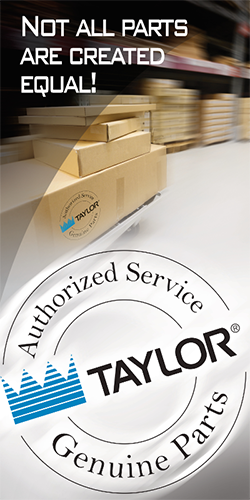 The Taylor C206 carts are sold separately. 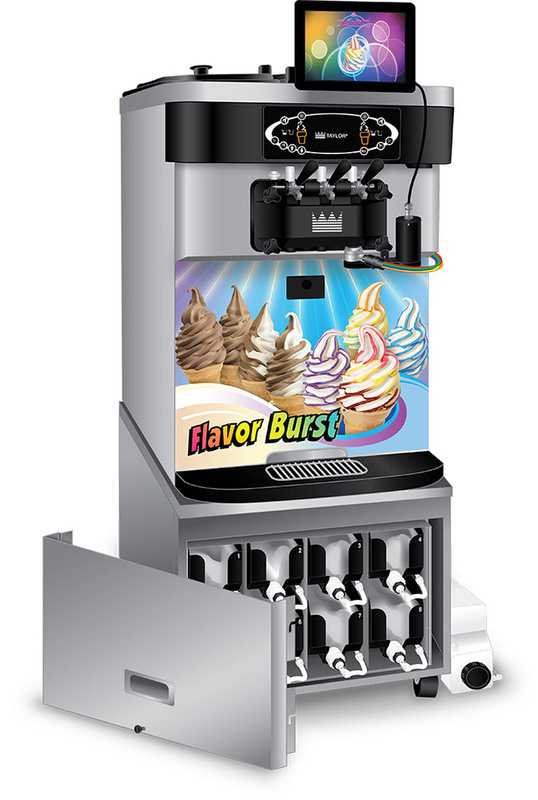 The CTP 40SS-JR “Junior” is our half-sized unit, with only 4 flavors in a shortened cabinet. 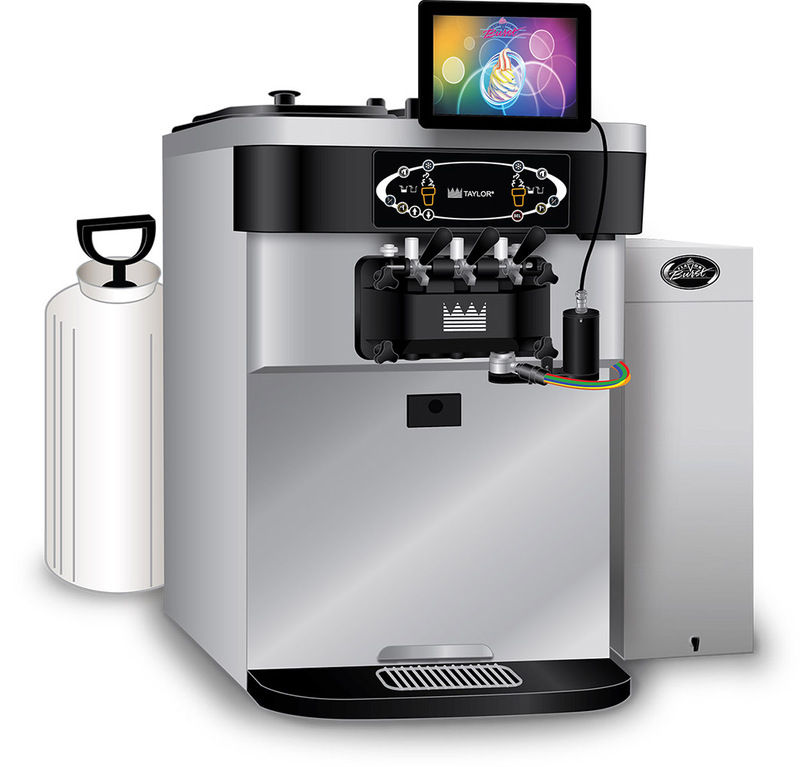 If space is a concern, this model may be a good option for you. It is short enough to fit underneath counters or inside most cabinets, including the Taylor C201 cart. 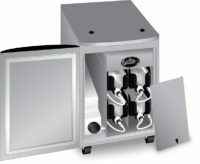 While the sanitizer tank is external, it is the smaller 2-gallon tank.